1. It is an ugly picture disc. 2. I am not a fan of Jean Marie Pfaff. 3. It is a Belgium record. 4. It has no value. 6. I never wrote about the record, nor did I use it for a CD compilation or a radio show. 1. It is a picture disc. 2. Jean Marie Pfaff is Belgium most famous goal keeper and this is probably his only record. And within this category of Famous throats he is definitely not winning a prize for the worst record. 3. 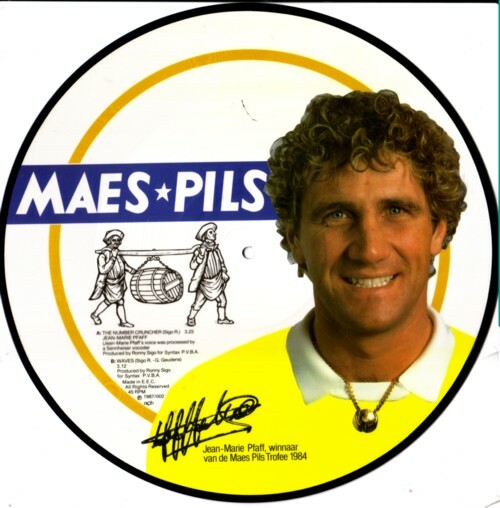 It is a Belgium record, but sung in English. 4. Because the record has no value, it will not be easy to find it again if I did it away. And I have never seen a second copy of this 12 inch! 5. I only listened to this record once or twice. 6. If I am given the time, I would love to make a radio show or CD compilation of singing Belgium goal keepers! Life is way to difficult for people with minds like mine. ho ho, wacht even! Wil je mij vooraf even polsen als je plaatjes gaat weg doen? Ho ho, wacht even! Wil je voordat je Jan polst mij polsen als je plaatjes gaat weg doen?! En dat je een plaat maar 1 of 2 keer hebt gedraaid, is geen excuus. Je doet een boek toch ook niet weg omdat je het nog nooit hebt gelezen?